Lisbon is beautiful. It’s also quiet, calm and really atmospheric. I know it’s hard to believe it after walking the streets in Alfama, or Baixa Chiado, especially in the Summer. 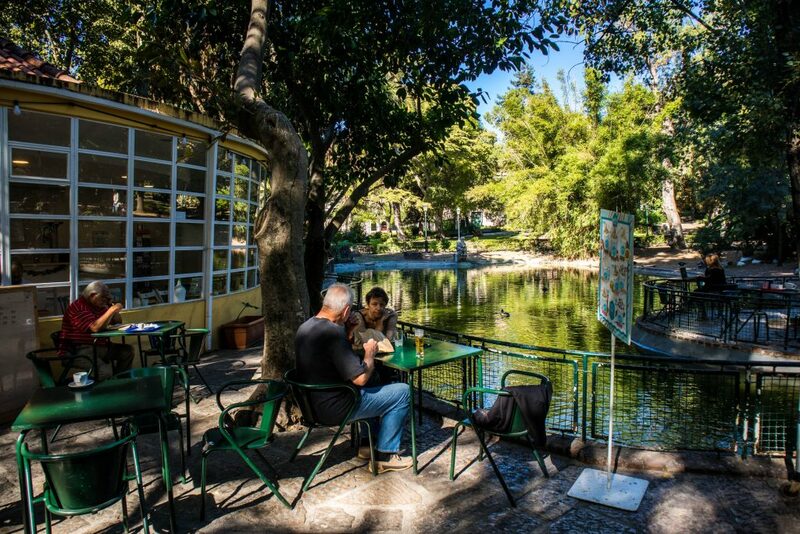 But there are places in the city, where you can still enjoy the true, local vibe and see how the real Lisboeatas live. 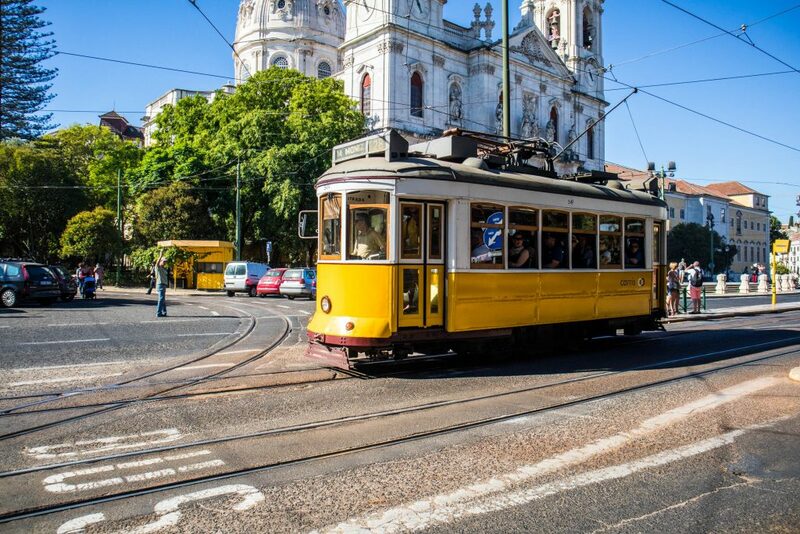 Lisbon has become the must-see city in Europe for many tourists. Apparently, it has more visitors every year than Venice or Barcelona. This means crowds. The streets in the center are usually flooded with people at nearly every time of the year. Apartments are changed into Aibnbs and prices of all the delicious Portuguese specialties have skyrocketed in the recent years. There are hawkers on every corner and most of the tours focus on the most popular spots. Locals try to keep away from the crowded streets and they disappear in the sea of visitors. 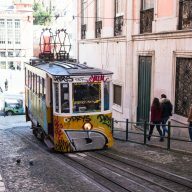 While Lisbon’s popularity is definitely good for the economy, it doesn’t make it easier for you to see the real deal and it’s harder to get away from the tourist traps. 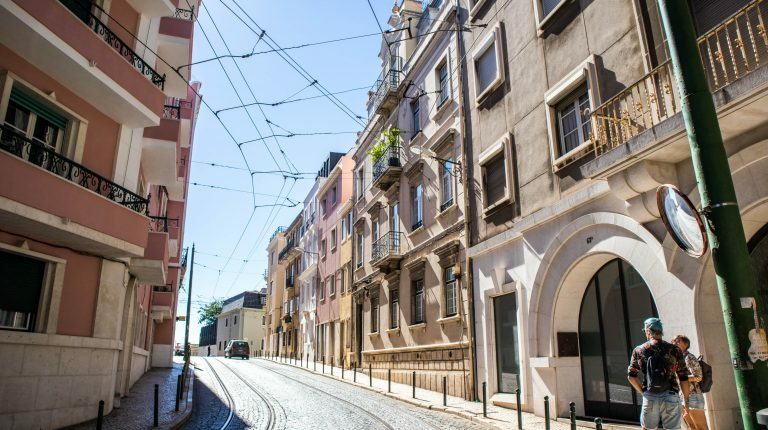 You may wonder where Lisbon’s off the beaten path spots are and if they actually exist. I can tell you that there are plenty of them and they are not even that far away from the center. I have been lucky enough to discover some of them recently. Always ready to explore Lisbon! Last year I spent most of the winter walking the streets of Alfama and Bairro Alto. I can say that I saw all the major attractions and I was ready to see something more. With the beginning of Autumn, I started planning my sightseeing for this part of the year. Because I don’t know the city well, I struggled with finding interesting places. There wasn’t that much information in English and I found it extremely difficult to set a plan. I then discovered Withlocals – a company that gathers independent, local guides and connects them with tourists. They offer all kinds of tours around the world and each of them is unique and can be tailored to your needs. I didn’t think twice. 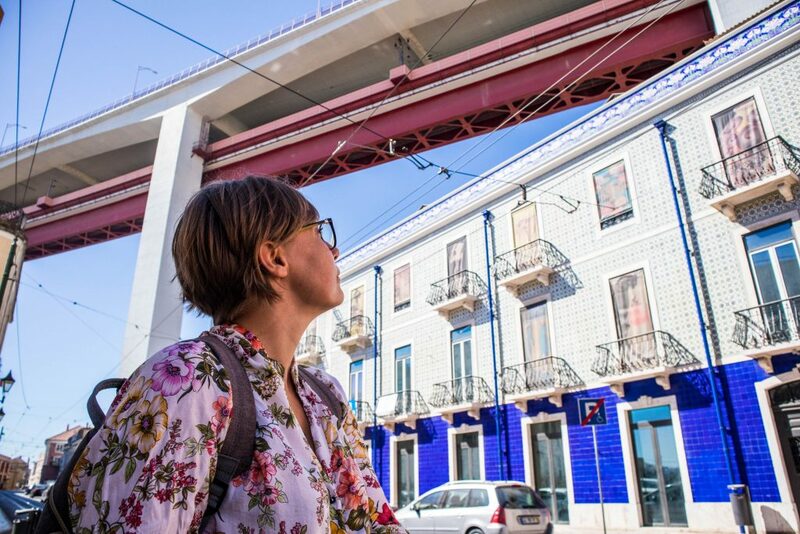 I contacted them and a week after I was exploring new areas with Wolfgang – my lovely guide, who introduced me to a completely new face of Lisbon. 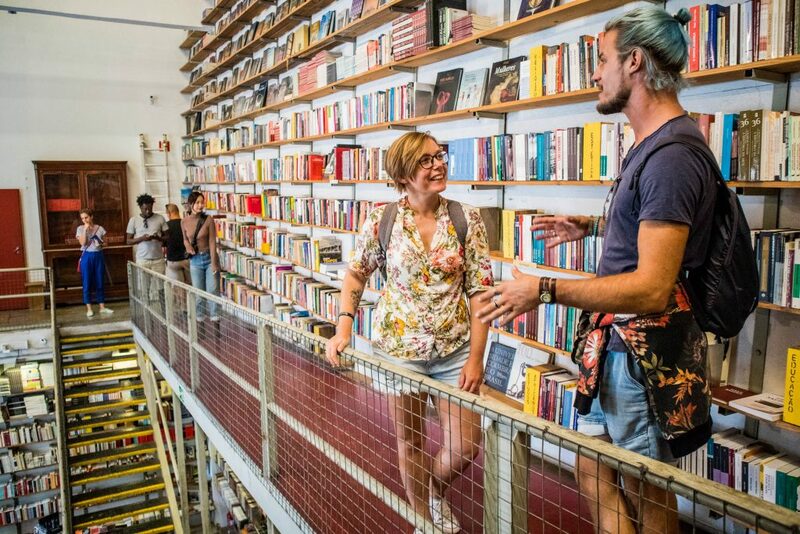 Before we move on, a disclaimer: The tour was offered to me free of charge by Withlocals that offer various Lisbon private tours to try out their services, and because I liked it, I have since become an affiliate for them. This means that if you decide to book a tour with Withlocals through one of my links, I will get a small portion of the profits at no extra cost for you. Exploring new sites and places is one of my favourite things to do in my free time. Why book a tour with Withlocals? I love exploring new areas and new cities and I normally do it alone. This way I can take things slow, not rush and find some true gems. I don’t hate guided tours and if I don’t have any other choice, I usually go for it. I completely understand why some people prefer seeing the destination with a guide and I know that to many it makes things easier. However, I’ve had my share of really bad tours. They were normally those that were organized by commercial offices with 10 other participants and a guide that was too tired to answer questions. For a while now, if I want to go on a tour, I choose to hire a freelancer and someone who actually has a passion for tourism and wants to show others their city. 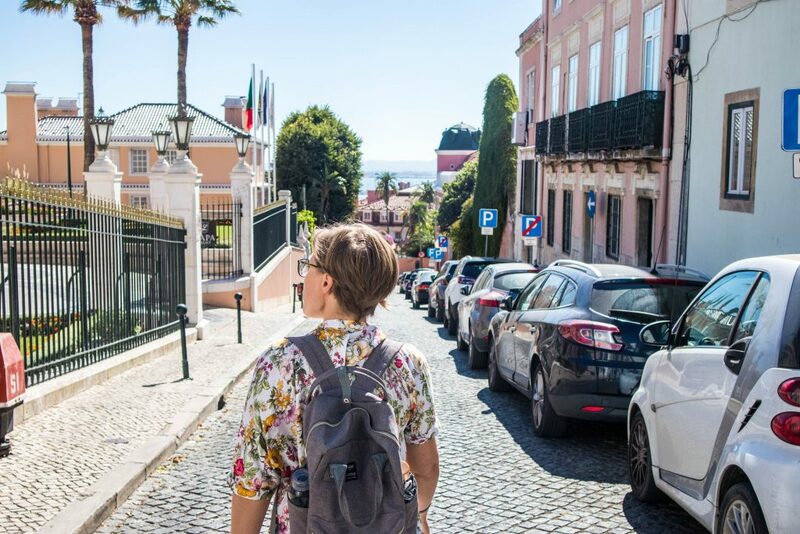 Walking the streets of Lisbon with a local is a totally different experience. This was my impression that I had when I discovered Withlocals. All of their guides can sign up to work with them independently and they can choose what to show to their customers. You can pick not only the tour but the guide, too. There are a few guides offering a trip with the same concept. You can watch a short introduction video for each of them and then choose the person you think will be the best for you. Their app is awesome, too. It’s so intuitive and really fast that you are tempted to browse for a long time to find what you look for. You can also message your guide and tell them what you expect from the tour and if you have any special requests. Before the tour you get short reminders, so you don’t forget when and where to meet. I was very excited to find out that they have an off the beaten path tour in Lisbon. When I saw the itinerary, I knew that I had to use the opportunity to go. I chose to go with Wolfgang, who has been living here for 3 years now. The tour with him turned out to be even better than I had imagined! I met Wolfgang at Basilica da Estrela – one of the oldest churches in Lisbon. It’s beautiful, white façade is a lovely background for passing yellow trams and is quite a popular spot in the city. We went inside admiring the colorful walls and beautiful architecture of the church. Wolfgang told me the history of the place, pointing out some interesting details. The area around the church is absolutely stunning. After leaving the church we crossed the street to the Jardim de Estrela, which is located just opposite the church. I had been there before and I had had a pleasure to work from this beautiful place. On a sunny morning, the park looked even better than during my first visit. I was told that none of the plants growing there are common to Portugal and they were all imported. We were lucky to stumble upon a little market, where sellers sold handmade goods. How lovely is this park? I once came here to work. After taking a lot of photos, we strolled to Campo Ourique – a very nice area, where the rich and beautiful of the city live. I was amazed by the lovely streets, shaded by huge trees and fancy shops with designer clothes. Even Burger King looked a little better than anywhere else I’ve seen. I think one of the best things we did on this tour was visiting a small park – Jardim Teófilo Braga (da Parada). It’s really just a square with a pond (look out for small turtles! ), but it has an amazing local vibe. It was a Sunday, so there were a lot of people around: families with kids playing and friends having a chat. 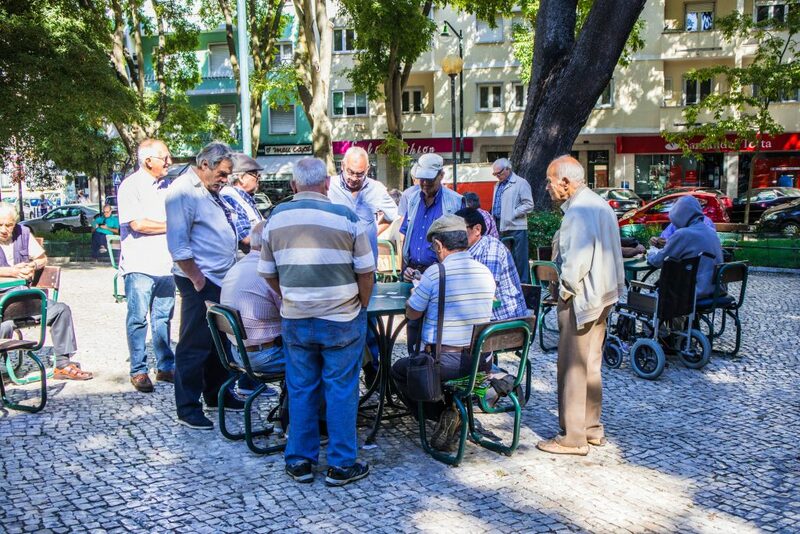 In one corner of the park, a big group of older men was playing cards, which I absolutely loved. I don’t see this happening that often on the streets of Lisbon and I always thought that scenes like that are very characteristic to Midettereanan countries. This is what I call a local vibe! We sat down for a coffee. The kiosk in the park serves a really great brew, very smooth and creamy. It is also famous for its burgers. I haven’t tried them yet, but Chris and I are definitely going there next weekend! Another surprise was Aloma Bakery. 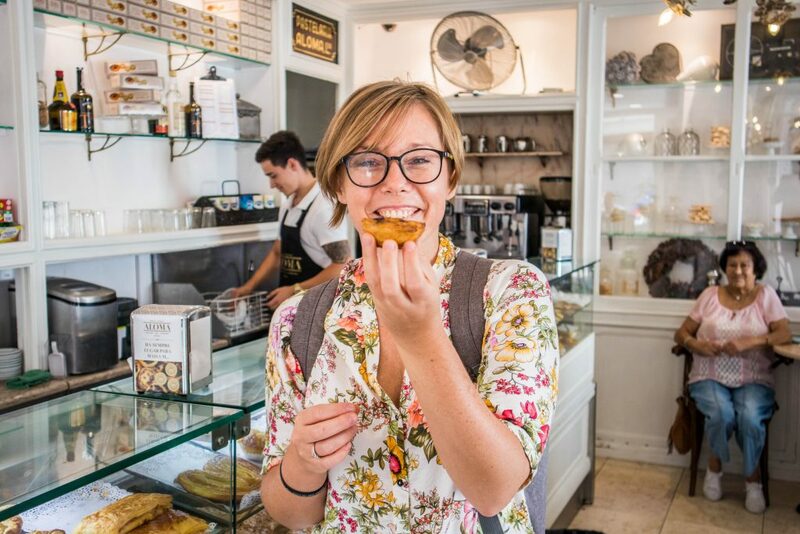 Wolfgang said that they sell one of the best pasteis de nata in Lisbon. So far I have tried my share of them and have 2 places in the city, where they are extremely good (including the bakery in Belem), so I took Wolfgang’s word with a grain of salt at first. But what a surprise! The pastries were really good! They melted in my mouth and the pudding inside was so light. I also loved the decor of the bakery. Instagrammers, this is a nice place for photos (you’re welcome). Our next stop was Mercado de Campo de Ourique, which I haven’t heard of before. 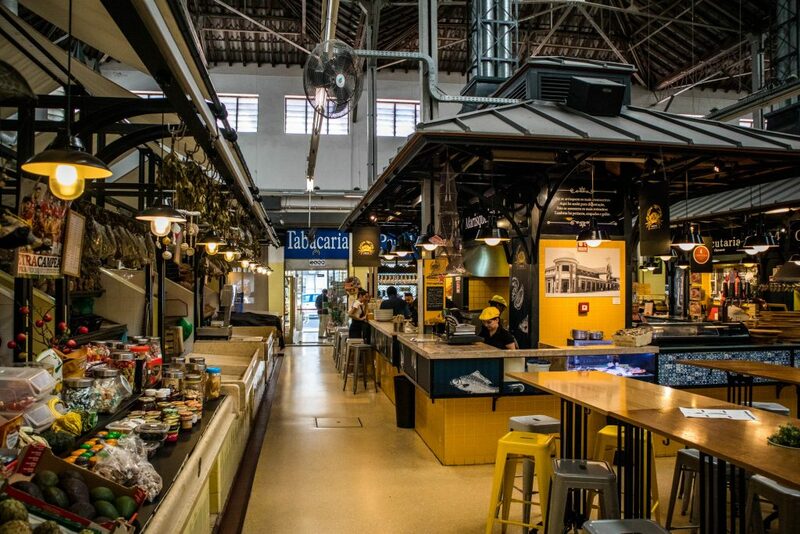 It’s like the Time Out Market, which is one of the must-see places in Lisbon, but with a more local feel. You can try some Portuguese specialties here, drink some gin, wine, but nice souvenirs (a soup in a shape of azulejos anyone?) and during the week you can buy fresh fish from one of the vendors. It was very quiet on that day, but the market was lovely nevertheless. During the whole time, we chatted with Wolfgang about his life in Portugal and his take on certain things. As you might have figured out, Wolfgang is not Portuguese. He comes from Germany and moved here 3 years ago. I found it fascinating how he adjusted to life in Lisbon. He even learned the language without going to school. He has been working for Withlocals for a while now and his passion is to show others his favorite place on the planet. He loves the city and the life he has here and that shows during his tour. I actually didn’t ask him, but I think he loves art and architecture. That’s why I had a chance to see all the little gems, like an old yellow house with a surrounding scaffolding. I wouldn’t have even looked at it, but Wolfgang drew my attention to its façade and then pointed out a small church just behind the main building. It had a cute bell tower and a small fountain. I wish I could visit it one day when they finish the renovations. Wolfgang was pointing at different things to me all the time. I was in awe of the city all over again. We slowly made our way through Madragoa near Santos. My favorite place there was a small French bakery overlooking a beautiful square. Another place to add to my ‘I want to eat there’ list. The area further down the road was even more lovely. There were no cars on the streets and almost no people. Tram tracks cut the main roads and at the end, I could see the sparkling surface of the river. Absolutely lovely! We finished the tour at LX Factory, a hipster hangout and another famous spot on the map of Lisbon. I had been there before but during a rainy, cloudy day. This time the place gave me a totally different impression. It’s definitely somewhere worth going on a sunny, Summer afternoon. Christopher and I have already tried hot dogs at Dogs and this time we went for Asian food just next to the well-known and very ‘Instagrammy’ bookshop. If you miss or want to try, some dishes from Thailand or Vietnam, I highly recommend this place. Pho and Pad Thai are definitely worth their prices. Wolfgang told me that he is thinking of doing an Instagram tour. I think that’s an awesome idea. When we got back home, I was buzzing with excitement. I really couldn’t wait to tell you all about the tour with Wolfgang and Withlocals. I really think that one part of visiting Lisbon should be getting to know the local culture and seeing all kinds of places in the city, getting out of the center and seeing something more. You can do it on your own with no problem, but if you hire someone to take you around and tell you some stories about living in the city, you will definitely get a lot more out of your stay in the capital. Withlocals organize tour all around the world. You can book them through their website. 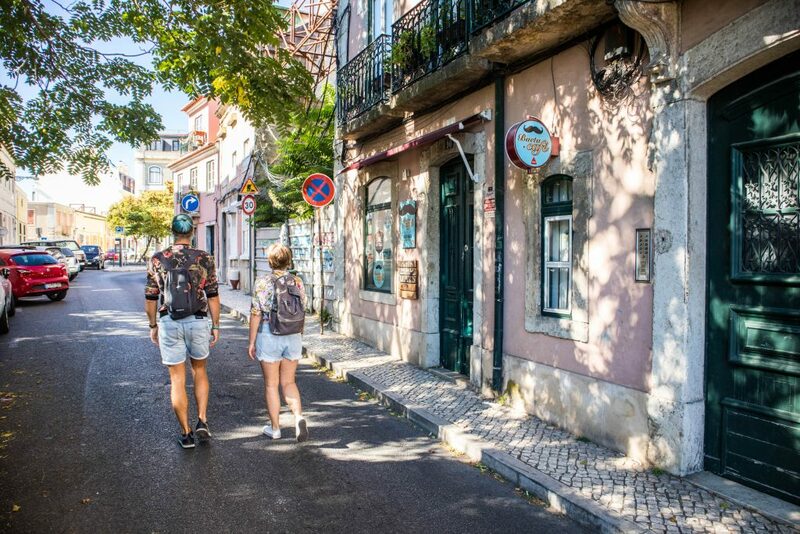 Bairro Alto: Don’t miss these places!